Apple is known for eschewing popular social media platforms such as Facebook and Twitter. So it's interesting to see the company launch a Tumblr page this weekend, complete with four dedicated 15-second videos delivered in English, French and Spanish. Their titles: "Porte de Lilas" (the gates of Paris); "Viva o Carnaval" (Live the Carnival); "Showtime; and, "Enjoy the Show." 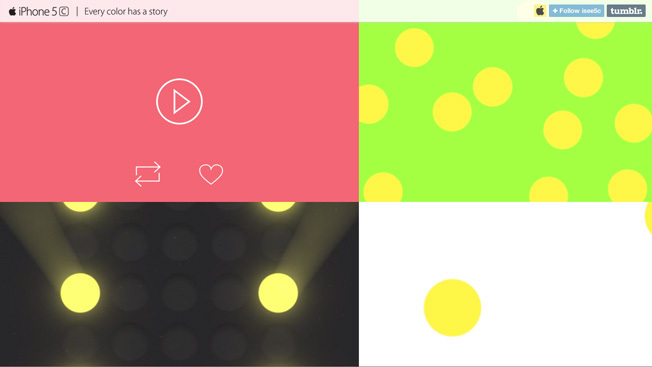 The spots pitch the five-month-old iPhone 5C, featuring the product's colorful look and accessories. The campaign tagline: "Every color has a story." The development began making the Twitter rounds on Sunday. Adweek reached out to Tumblr for more information but didn't get a response from the New York company. The campaign is also noteworthy because of its emphasis on video. For many brands on Tumblr, the focus has been on creating Gifs that they hope gain viral traction. Additionally, Apple's play suggests that Tumblr—which Yahoo purchased for $1.1 billion last year—is attracting a greater array of marketers. While the platform has been a hit with movie brands such as Paramount's "Anchorman 2: The Legend Continues," it is going to need more consumer product brands to get on board as it looks to increase monetization.